Fix to conflict between the Delphi Dev. Shell Tools and AVG Antivirus. I just detect a conflict with the AVG Antivirus 2014 Shell extension . This cause which the Delphi Dev. Shell Tools menu is not show. To fix this issue you must disable and enable the AVG Antivirus Shell extension. Please follow the next steps to fix. 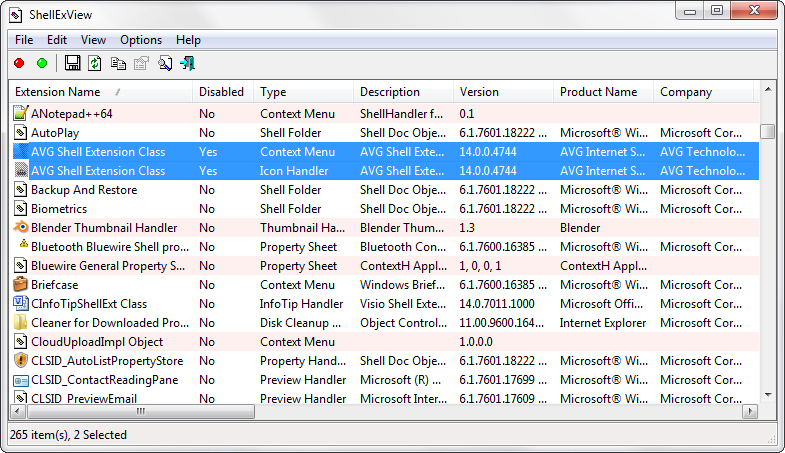 Locate the AVG Antivirus Shell extensions and disable it as is shown in the below image. Now both shell extensions should work normally. Categories: Delphi, Tools | Permalink. Hi – I just tried the required steps on a W7 64 machine running XE5 Pro. Unfortunately once the last restart is complete the Delphi Shell Tools (DST) are unavailanle, replaced by the AVG ones. I have reverted to the DST as last step by turning the AVG shell tools off in ShellExView – I much prefer the DST over the AVG shell. Is there another work around? Hi, if the workaround is not working for you, try unregistering the AVG shell extension with the regsvr32 command.